UK study: Videogames not bad for kids? It's more complicated than that. 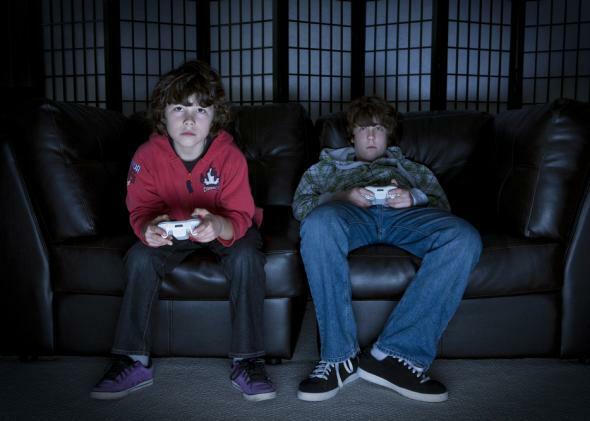 Did a Study Really Just Prove That Video Games Aren’t Bad for Kids? A recent study found no link between video games and bad behavior in seven-year-olds, but it’s far from conclusive. The holiday shopping season is upon us, and both Sony and Microsoft have just released brand-new, long-awaited video-game consoles, which means that kids will be clamoring for RPGs and first-person shooters even more than usual this year. The eternal question: Are you a bad parent if you let them have them? Hooray! At last, definitive proof that kids can play all the video games they want and suffer no ill effects, right? Clearly that’s a piece of news that people are itching to hear: Jane McGonigal, author of a bestselling book arguing that video games are good for us, tweeted her equally exuberant interpretation of the findings, and the response was overwhelming, with some 3,500 retweets. Not to be a spoilsport, but before we throw in the dustbin a bunch of other studies that have found links between youth screen time and antisocial behavior, it’s probably worth, you know, reading the actual paper. Which reveals that, in fact, the researchers did not track 11,000 kids for a decade. Rather, they drew their data from the broader, decade-long U.K. Millennium Cohort Study, but conducted their analysis only on a slice of data that looked at kids once at age 5 and then again at age 7. That is definitely not what the study said. Rather, the researchers looked specifically at whether kids in the Millennium Cohort Study who played a lot of video games at age 5 had grown substantially worse in their behavior by age 7 compared to those who did not. The behavioral outcomes were based on the kids’ mothers’ assessments, and the researchers controlled for a wide array of factors, including income and family structure. Their goal: to see whether video games and/or television alone could be linked to negative changes in behavior over a two-year period from age 5 to age 7. They did find some links between TV screen time and deteriorating behavior, but they did not find a link between video-game time and bad behavior (or ADHD, or emotional problems, or any of the other bugaboos that in the past have been ascribed to childhood screen exposure). Again, that doesn’t mean the kids who played lots of video games at age 5 were all perfect angels at age 7, just that they weren’t significantly worse than they already were at age 5, once you controlled for a number of other factors. As far as I can tell, the study did not look at all at the effects of video games or TV prior to age 5. These results are worth reporting, certainly, and may cast some doubt on earlier studies that have found such links. They should serve as a welcome corrective to a bunch of probably overhyped U.S. findings linking video games to attention problems. But in a strange reversal of the file-drawer effect, this solitary non-finding on video games among a very specific cohort has suddenly been taken up by the pro-gaming crowd as if it were definitive proof that no amount of gaming could be bad for any kids, of any age, anywhere. Our findings do not demonstrate that interventions to reduce screen exposure will improve psychosocial adjustment. Indeed, they suggest that interventions in respect of family and child characteristics, rather than a narrow focus on screen exposure, are more likely to improve outcomes. However, the study suggests that a cautionary approach to the heavy use of screen entertainment in young children is justifiable in terms of potential effects on mental wellbeing, particularly conduct problems, in addition to effects on physical health and academic progress shown elsewhere. To be clear, I’m not arguing that video games are bad for kids. I’m just pointing out that this study does not prove what quite a lot of people seem to want it to. Sorry, parents. Science is trying to get you an answer, but for now, you’re still on your own with this one. Again, the full study is here, and should be considered highly recommended reading for any other professional journalists who would like to comment definitively on its findings.